Mod version string (slugfiller) implemented: "enkeyDev.6"
Mod version string shown in client detail window. This works only between EDT compatible versions. It lets you known how much it will take to download from a specific source and is updated every reask (as the QR). The requester can see the EDT in "Remaining" column. The provider can see EDT for enqueued clients in their details window (N.S. means EDT "Not Supported" by that client). To have a reliable statistic, EDT performs no estimation until about 30 clients start download (and that can take very much). Anyway this is VERY experimental. Do not take EDT for an oracle, if the provider changes a file priority or shares another file or a million other things, your EDT changes consequently! This feature is the same as in earlier eDev mods. We chose to implement this because we find ECS incomplete. With ECS, if you have 8 sources and every chunk is owned by at least two of them, then every chunk is "common": you are allowed to choose the first/last, otherwise you will choose the longest-to-finish. This feature writes and keeps updated the file "config\PNRecovery.dat" that will help you recover files when you lose the ".met". For each record in the file, the part number, ed2k link and file name are saved in fixed lenght format. Du hast bei dem 1.Link auf die Binaries ein http:// zuviel drin und daher funktioniert der Link so nicht,ändere das doch bitte! 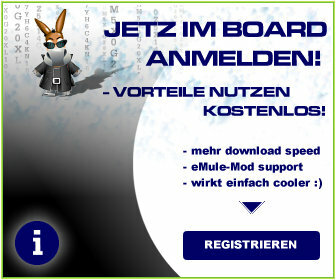 endlich mal ein mod mit icon-erklärung, sehr lobenswert. Schwache Leistung,wenn das für mich bei denen dann auch zutrifft,na dann guten Nacht.Ist das ein spezieelles Problem mit RSA-CIDE und wenn ja was machen?Ausserdem wie erkenne ich wenn mal ein User Secure ist ohne das ich alle Details ansehehen muss um den Status von RSA-CIDE SUI zuerfahren,hier gibt es wohl kein Icon,das wurde wohl vergessen.Dl noch 0 UL ok max 0,2 unter dem eingestellten Limit. bei RSA-CIDE Mods werden nur Mods als sicher erkannt die ebenso RSA-CIDE verwenden, darum der kleine Wert erfolgreicher Identifizierungen. Der Unterschied zum gängigen SI ist, daß bei der ersten Identifizierung der public key zum Userhash passen muß und nicht wie bei SI beliebig sein kann.